Hollow body. 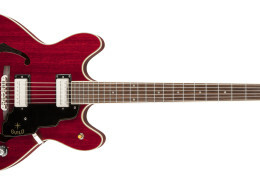 Guild’s Starfire III is equipped with features of extra advantage to the rock ‘n’ roll guitarist who seeks a combination of flashy appearance and extraordinary tonal possibilities. Stellar features are all here, including the extra-thin hollow body, graceful single Florentine cutaway and brilliant Black finish. The welcome return of a rocking early-’60s favorite with a personality all its own. Also available in classic Cherry Red.